THINKING PERSON'S GUIDE TO AUTISM: Mitochondrial Disease and Autism: Linked? Hannah Poling's family entered the national spotlight when they revealed that Hannah's autism-like symptoms may have been linked to a reaction to several childhood vaccines at once in combination with her mitochondrial dysfunction. Her case was not the first revelation of a possible mitochondrial disorder (MD)-autism spectrum disorder (ASD) link, but because of her ultimately successful vaccine injury suit, she became the avatar of the vaccines-cause-harm movement -- which almost eclipsed the real scientific and therapeutic feature of her case: the mitochondria. First, a little bit about mitochondria. A review paper, published in Molecular Psychiatry and open access, gives a fine and detailed overview, so my summary here is brief. The mitochondria do the heavy lifting for the cell's energy needs. They take the chemical remains of what we eat and transfer that energy into molecules that the cell can use. This process is complex and involves many steps and dozens of proteins. Each of those proteins traces its code back to genes in the mitochondria themselves, which have the distinction of being the only mammalian cell organelle with its own DNA. It also makes it own proteins, just like a tiny cell-within-a-cell. And just like any DNA, mutations can happen. These changes in the mitochdondrial DNA can translate into changes in the proteins they encode. Given the mission-critical job that each protein has in building energy-containing molecules, these changes can be bad. Very bad. The level of bad that results can vary from scarcely noticeable to all-out devastating disease. What complicates things is that the mitochondria in our cells can be genetically different from each other. We inherit our mitochondria from our mothers. In making the egg that will eventually fuse with a sperm and become us, she makes three other unused cells. 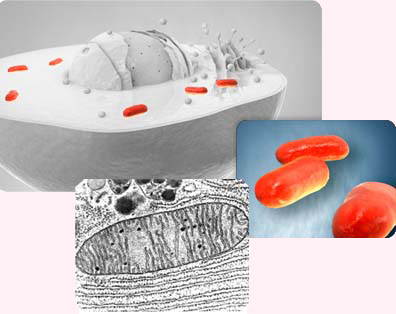 Her mitochondria are allocated into each of these three unused bits as well as into the egg itself. This allocation can be a bit of a gamble, as not all of the mitochondria are created equal: Some may carry some bad-protein baggage with them, and if the egg gets a walloping dose of these faulty organelles, then the resulting individual may have a walloping dose of mitochondrial disorder. Thus, it's entirely possible for a mother to be carrying around a few not-so-great mitochondria in her cells and be relatively unaffected because the healthy mitochondria make up for the gaps, while any offspring who end up with the bulk of the badly functioning organelles will show more signs of disease. Indeed, this scenario seems to have played out in the case of Hannah Poling, whose mother appears to have a low-level mitochondrial disorder while her daughter manifests it much more dramatically. Recent studies suggest a link between even subtle, asymptomatic mitochondrial dysfunction and ASD. The review paper is long and covers a lot of ground, so I've broken my discussion of it into bits that I hope the reader -- if you're still here -- can digest easily. The first issue worth noting -- and one that's been noted before -- is the much higher prevalence of MD in the ASD population. It's 5% among people with ASD, and only 0.01% in the general population. That's a huge difference and strongly suggests a much closer look at mitochondria in people with ASD and their families. The authors note that even this prevalence may be underestimated given that many studies didn't do what they'd consider to be a thorough enough evaluation for ASD, the exclusion of children with other disorders known to be linked with mitochondria, and the lack of appropriate screening markers in some cases. These markers are usually measures of chemicals that result from mitochondrial activity, and if their levels are higher or lower than normal, that can be a flag, or marker, of a disease state. They report that almost one third of the children with ASD in these marker studies had such flags, and that for every marker they examined, the ASD population had a significantly higher prevalence of abnormal marker levels. The authors say that these findings are "consistent with the notion that a subgroup of ASD children has abnormal mitochondrial biomarker values or that the range of...values...is much larger for the ASD population." They go so far as to use the word spectrum, saying that the analysis results suggest "that children with ASD might have a spectrum of mitochondrial dysfunction." Most of those markers are proteins, and their code lies locked in the mitochondrial DNA (or in the nuclear DNA for a few). One natural place to look when there's a suspected dysfunction is at the genetic code for those markers. The authors examined papers that analyzed gene sequences and turned up very little in the way of known, disease-linked mutations and ASD. They note that very few ASD individuals have been identified who have specific mitochondrial DNA mutations; for example, in a study of 129 people with Asperger's syndrome and 138 mothers looking at one well-established mitochondrial mutation, not one single participant carried it. Another study that grouped individuals based on their mitochondrial DNA sequences -- a common way of tracing ancestry -- found no link between specific groups and ASD. Examinations of the few nuclear DNA genes for mitochondrial proteins also have found no links. Thus, tracking down mitochondrial dysfunction in the context of ASD to a specific mutation has remained an elusive goal. Two scenarios are likely for this lack of mutational findings: (1) there are mutations, but we just haven't found them yet; or (2) the environment is largely responsible for any mitochondrial dysfunction that abnormal marker levels might indicate. Naturally, with genetics studies, family history carries some weight. Eighteen studies have examined a total of 112 children with ASD and MD, and of these, only eight studies reviewed the family histories of its cases. Three of these eight identified a family history of MD, but nothing about these findings can be conclusive because of differences in diagnostic criteria or a total lack of information about diagnostic criteria. Sigh. When will we ever learn? The brain is an energy hog, and the mitochondria do all the work required to keep the brain developing and functioning. Some studies have used imaging techniques to visualize the map of marker activity in the brains of people with ASD. They've found that the way the brain produces and uses these markers is distinctive in ASD brains compared to non-ASD brains. Here's where things really start to get interesting. Yes, I made you wade through all that tough molecular stuff to get to this point. The authors make two relevant comparisons in this paper. The first is between people with both ASD and MD and people diagnosed only with ASD. The second comparison is between the ASD+MD population and people diagnosed only with MD. Classic Design 101, right there. Let's look first at the ASD+MD vs ASD comparison. The review of published papers showed that children who have ASD+MD also have distinct characteristics compared to children diagnosed with ASD only. Among these are developmental regression (a loss of acquired developmental milestones), seizures, motor delay (such as significantly delayed walking), and -- of great interest to many autism parents -- gastrointestinal (GI) abnormalities (reflux, diarrhea, inflammation, or constipation). For the ASD+MD population, these features are significantly more prevalent compared to the ASD-only population. Also of interest was the crossover finding: hyptonia, or low muscle tone, had the same prevalence in the two groups. GI problems are an oft-reported complaint among autism parents. The authors note that the prevalence of these GI problems was 74% in the ASD+MD population and describe a report linking mitochondrial dysfunction and inflammatory bowel disease (although that work was done in mice, which are not, it bears repeating, tiny humans with tails). They also say that it's possible that products of the digestive tract, including bacterial products, might be toxic to mitochondria and even contribute to seizure activity. Finally, they hypothesize that mitochondrial dysfunction can lead to breaches in the barriers between the GI tract and the rest of the body and between the brain and the blood. In other words, they took the GI results and used them to seed an entire acre of hypotheses to investigate. The authors also evaluated how markers of MD differ between the two groups and found some evidence of a greater prevalence of marker abnormalities in children with ASD+MD vs those with ASD only. Finally, and this one's a big wow: The ASD+MD population had a "significantly more balanced male:female ratio than children from the general ASD population." We've likely all heard about how autism affects boys at far higher rates than girls. Not so in the ASD+MD population, which, if it holds up, implies a completely different or additional way that the ASD develops. The heavily male-biased ratio in the autism population -- which probably will drop some as our understanding of autism and girls increases -- still strongly implies involvement of "male" hormone pathways. The lack of this imbalance in the ASD+MD population suggests a non-hormone-based path to the disorder. In this comparison, the male-biased ratio was the same between the groups; in other words, MD also showed a male bias. That doesn't jibe too well with the idea of a non-hormonal cause underlying ASD if the MD-only population also shows that bias. It may be that the MD-only population here also has ASD but that their MD has attracted all of the attention, leaving alone any questions of an ASD diagnosis. Based on studies done so far, these two groups do not differ in prevalence of developmental regression, seizures, hypotonia, cardiomyopathy (heart disease), or myopathy (muscle disease). They did differ, however, for prevalences of fatigue/lethargy, ataxia, GI abnormalities, and one marker of mitochondrial disease, all of which were more frequent in the ASD+MD population. MD children were more likely to have visible cellular abnormalities compared to ASD+MD children. No child in any of the reviewed studies who had an ASD+MD diagnosis presented with what the authors refer to as "classic mitochondrial syndrome." They speculate, as I have above, that some children with MD may not ever be evaluated for ASD, as their MD is front and center to family and health professionals. Or, it may be that children who have MD don't have typical ASD symptoms. The authors ask the important question: Are children with ASD+MD a distinct subgroup of children with ASD, or do they represent a distinct MD syndrome? Their analysis showed an overall prevalence of ASD or ASD features in 4.5% of children with MD, almost the mirror image of the 5% prevalence of MD in the ASD population. They describe two studies that have found a correlation the presence of MD markers and ASD symptom severity, suggesting a continuum for mitochondrial dysfunction that seems to mirror the spectrum, or continuum of ASDs. Regression is an important part of the autism discussion. Some parents report a noticeable regression in their children, while others report having observed autism symptoms almost from birth. Thus, a look at regression and what might be associated with it can help resolve some of these questions and distinctions. Regression prevalence was twice as high in children with ASD+MD compared to children with children diagnosed with ASD only, and this finding requires a closer look. Regression also has been identified in people with MD, often in association with stressors like dehydration, fever, or infection. In the case of Hannah Poling, for example, her parents describe her having developed a very high fever following a series of shots in one physician visit, and then exhibiting regression. The review authors here suggest that regression is likely related to MD in at least a subset of people with an ASD diagnosis. They point out that being able to identify the presence of MD could help families avoid exposure to some of the stressors known to have triggered regression in children with established MD. The authors identify one study that linked exposure to thimerosal with changes in negative mitochondrial outcomes in cells from ASD individuals compared to cells from individuals without ASD. This single in vitro study does not implicate thimerosal in ASD or MD, and childhood exposures to thimerosal have lessened, not increased, over time. What is of greater interest are the suggestions that exposure to diesel exhaust particles can inhibit mitochondrial function, along with exposure to other environmental toxicants, including heavy metals, polychlorinated biphenyls, and pesticides. Indeed, even as childhood exposure to thimerosal has dropped to zero, exposures to these other factors has likely increased. Studies on PCB mobilization in breast milk are one example of how our children may be increasingly exposed to these demonstrably hormonally active contaminants. The review paper authors also mention abnormal calcium signaling and, in an interesting note, report that chelating for high calcium levels led to improvements in levels of one biomarker. Yep. Chelation for high calcium. They also describe animal models in which products of GI bacteria and GI processes are associated with social interaction problems and mention propionic acid and Clostridia overgrowth as potential culprits in GI symptoms. A meta-analysis (analyzing beyond the original analyses) and a review (meaning a review of the relevant published data on a specific topic) like this obviously is going to have a long list of caveats. The first one that leaps out to me is this: Where is the evaluation of diagnostic criteria for ASD? I can't find that the authors examined papers to see which criteria were reported (if any) or which "kind" of ASD was present in the populations measured. That leaves a lot of question marks in my mind. The leading question mark ends this sentence: "Is MD associated more strongly with 'classic' autism symptoms? "What they describe seems to suggest that the answer is, "Yes," but that analysis is not presented. The limitations the authors note are many and relevant and include the large variability in how markers were measured and reported and in diagnostic criteria used and reported for MD, and the small populations of the studies, some of which were just cases or small case series. Finally, there is the issue of referral bias, in that there was no prospective, before-the-fact evaluation for either ASD or MD; rather, the children who were diagnosed likely were referred because they seemed to have one or the other. Yes, there seems to be solid information suggestion a link between MD and ASD, especially ASD that manifests with specific symptoms such as seizures, GI abnormalities, regression, and motor delay. Yes, there is likely an environmental involvement in these mitochondrial disruptions, but I could say that about any disorder that shows variability in symptom intensity. Potential triggers that obviously require investigation include PCBs and heavy metals. The ability to identify mitochondrial deficits before a fever or illness strikes might benefit what adds up to a substantial number of children and their families. So, let's keep looking at these mitochondria, people. A version of this essay was originally published on The Biology Files.